The Northeast Generals completed the North American Hockey League playoff field Saturday when David Fessenden stopped 25 of 26 shots in a 2-1 victory over the New Jersey Titans. Gerard Marretta and Louis Boudon scored the goals. The third-place Titans beat the fourth-place Generals 4-3 in overtime on Ryan Naumovski’s overtime goal when the teams played the only game Sunday to close out the league’s regular-season schedule. Northeast (24-25-7-4) edged the Wilkes-Barre/Scranton Knights (26-29-4-1) by two points despite a big finish by Jake Fuss in a pair of weekend wins. Fuss had a hat trick and two assists in an 8-1 win Friday, then two more goals Saturday in a 5-4 overtime win over the Maryland Black Bears. NAHL ROUNDUP: The Corpus Christi IceRays grabbed the last playoff berth from the South Division Friday when Matthew Headland scored early and Samuel Vyletelka made 34 saves in a 1-0 win over the Topeka Pilots. The East Division champion Johnstown Tomahawks finished with the league’s best record at 47-9-3-1 by scoring three third-period goals Friday to pull out a 3-2 victory over the Jamestown Rebels. Carter McPhail saved 43 shots. Johnstown and the South’s Amarillo Bulls had the same number of points in the standings, but the Tomahawks had one more win. Logan Jenuwine became the league’s first 60-goal scorer, with goals in each of two wins by Amarillo over the Odessa Jackalopes. His 104 points are the most in the league since the 1989-90 season. REPEAT PERFORMANCE: Bobby Brink is the United States Hockey League Forward of the Week for the third straight week. 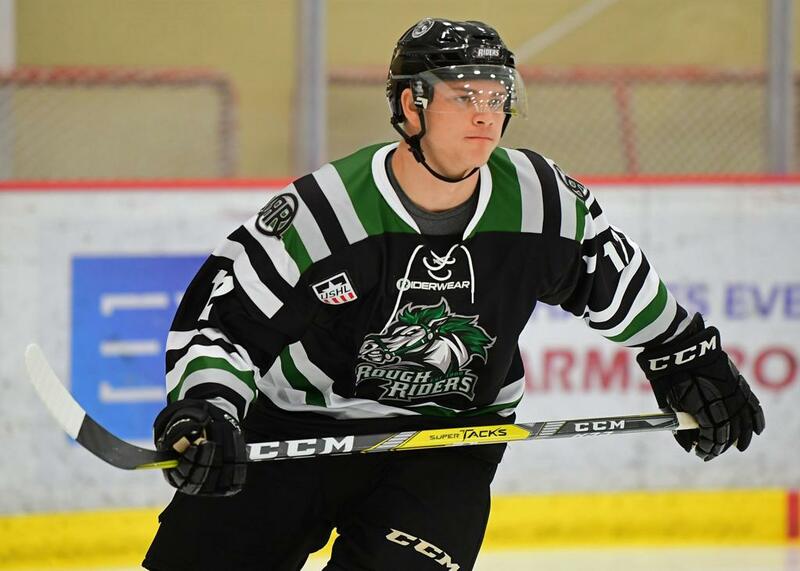 The Sioux City Musketeers forward had two goals and three assists while going plus-5 in two games. Brink is the first player to ever receive the award three times in a row and ties the record for most times in a career with five. Last week’s effort gives Brink a team-high 67 points on 35 goals and 32 assists. The University of Denver commit ranks second in the league in goals and fourth in points. Brink’s season also included a gold medal with Team USA at the World Junior A Challenge. COLLEGE COMMITMENTS: Brandon Puricelli, a forward with the Springfield Jr. Blues of the NAHL, has committed to the University of Minnesota-Duluth. The 21-year-old from Ellisville, Missouri, set a team record with 50 assists this season. His 30 goals in 59 games gave him 80 points to rank fourth in the NAHL and second-best for a season in team history. Puricelli led all NAHL players in March with 23 points. He had nine goals, 14 assists and a plus-9 rating. He made his commitment on the day the league named him Player of the Month for that effort. Lincoln Erne, a defenseman with the Minot Minotauros, has committed to play at Canisius College. Erne played for the Central Division team in the NAHL Top Prospects Tournament. The 20-year-old from Blaine, Minnesota, led Minot defensemen in scoring this season with 34 points in 59 games. Jacob Semik, a defenseman for the USHL’s Dubuque Fighting Saints, committed to Arizona State. The 19-year-old from Canton, Michigan, has 19 points in 55 games. COACHING CHANGES: Carter Foguth, who served as interim head coach since late November, has been named head coach of the NAHL’s Chippewa Steel. Greg Gatto stepped down after five-plus seasons as head coach of the NAHL’s Odessa Jackalopes. The NA3HL’s New Ulm Steel have hired Zach Stepan as head coach. Stepan served as assistant coach of the NAHL’s Chippewa Steel in the NAHL.